February 6 is the day of frozen yogurt, or shortly: Frogurt. 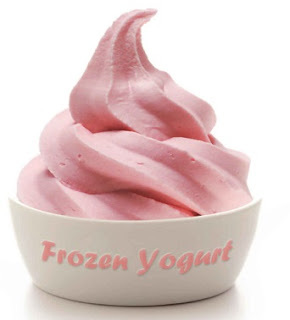 Frozen yogurt is a frozen dessert that resembles ice cream, only made of yogurt. Yogurt contains bacterial cultures and is therefore healthy. Besides the good bacteria in the intestines, yogurt has other nutritional values ​​such as calcium, protein, vitamin D and vitamin B-12. Frozen yogurt contains fewer calories than ice cream (depending on what you add to it). You can add frozen fruit, sweets, cookies, creams and more to the frozen yogurt, according to personal taste. Ingredients of yogurt are yogurt, sweetener, gelatin, sugar syrup and flavorings, frozen in an ice cream machine. The yogurt is frozen at a lower temperature than the ice cream, so it thaws more slowly and less dripping from ice cream. People began to eat yogurt as early as 4,000 years ago, especially in the Middle East and India. In the early 1900s yogurt arrived in the United States and began to become popular among the population as healthy food over the next decades. In 1930 the Danone food company began selling yogurt packed until the 1970s. During these years, the popularity of ice cream increased, and Danone tried the ice cream production technology for yogurt. Some of the consumers liked it but some actually complained about the taste. In 1981, TCBY opened the first store of frozen yogurts. They sold the sweet ice-cream yogurt in their stores, but unlike Danone, they did not market it in packaged boxes, but they filled customers with trophies with machines. The name TCBY was initially: This Can't Be Yogurt, but after being sued by I Can't Believe It's Yogurt, they changed their name to The Country's Best Yogurt , Which is still the same acronym. The sales of the Frogurt rose dramatically, reaching sales of $ 25 million in 1986. The frozen yogurt accounted for 10 percent of the frozen desserts market in the US, and in the mid-1990s sales reached over $ 300 million, but in the late 1990s Of the Americans and the fashion of frozen yogurt has passed from the world. In 2000 the frozen yogurt rose to life with the introduction of mixtures containing live probiotic powder. The powder was invented by John Wudel, the pioneer of the distribution of alternative sweeteners in the frozen dessert industry. In 2005, a small retail store in California named Pinkberry introduced new market additions of soft frozen yogurt. In 2006, Yoghurtland invented the first self-assembled frozen yoghurt in their first store in Fullerton, California. The yogurt has a fresh tenderness. Hundreds of yogurt and yogurt shops where buyers can choose the type of yogurt they want and the extras are opened. How to Celebrate the Day of the Frozen Yogurt? Well, what a question, obviously eating Frogurt! Buy in the ice cream parlor or in a special yogurt parcels store or you can also prepare at home.